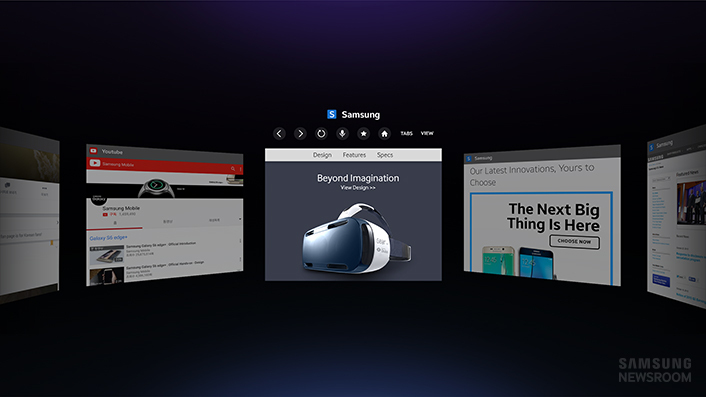 A new platform without any relevant content isn’t very exciting, so Samsung wants to bring all of the Web to its new Gear VR headset with a new virtual reality browser. The rather dryly named ‘Samsung Internet for Gear VR’ allows you you to browse through Web pages without having to remove your headset. Perhaps even more useful is the ability to watch videos from sites right on your headset, without having to download them and/or open up a separate app. It seems pretty well-stocked with features so far. You can use voice recognition for input, or an on screen keyboard for when you need the extra precision. And using the headsets Gaze Mode feature, you can select menus simply by looking at them. You can also import bookmarks from other browsers, too. Though we haven’t had a chance to try it yet, it will likely not be the most ideal browsing experience; resolution gets cut in half by virtual reality headsets, which combined with the higher magnification provided by the lenses will likely make for some pretty blurry text. Still, it’s nice to have when you don’t feel like removing the headset, and looking through all your tabs will probably be a little more fun in VR. A beta version of the app will be available for download in the Oculus Store starting tomorrow. You’ll need a recent Samsung flagship phone to try it out though, starting with the Note 4.